Landing missions to celestial bodies in the Solar System will form the backbone of Russia’s space research program in the coming decades, a prominent Russian expert said Monday. MOSCOW, April 8 (RIA Novosti) – Landing missions to celestial bodies in the Solar System will form the backbone of Russia’s space research program in the coming decades, a prominent Russian expert said Monday. “We’ve found our direction, our niche,” Lev Zelyony, the director of the Institute of Space Research at the Russian Academy of Sciences, said at a press conference in Moscow. The Soviet Union has a track record of successfully landing unmanned probes on celestial bodies, including two moon rovers as well as a number of probes to Venus, an achievement that has not been reproduced since by any other space agency to date. However, Russia’s space program was largely halted after the Soviet Union’s collapse, though it is gradually being redeveloped on a smaller scale, Zelyony said. Russia plans to send a succession of five unmanned probes to the Moon between 2015 and 2022, the latest set to retrieve samples of lunar soil. The 2015 probe was supposed to be called Luna-Glob-1, but the name will be changed to Luna-25, indicating continuity with Soviet-era lunar missions, named Luna-1 through Luna-24, Zelyony said. 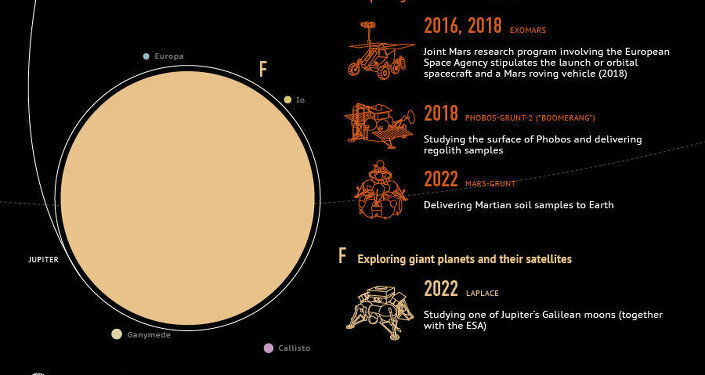 Russia’s Federal Space Agency and the European Space Agency (ESA) would also jointly develop two unmanned Mars probes, said Rene Pischel, the head of ESA’s mission in Moscow. The probes are set to launch in 2016 and 2018, and would study the planet’s atmosphere and map out traces of water, Pischel said at the press conference. Another joint project would be an unmanned probe to Jupiter’s moon Ganymede, expected to launch in 2023, said Oleg Korablyov, who heads the planetary study department at the Institute of Space Research. The Europeans wanted the probe to go to the other moon, Europa, for symbolic reasons, Zelyony said. But this destination is currently unfeasible because Europa is set in the gas giant’s radiation belt, whose effect would cripple any modern electronics, he said. Longer-term prospects for the global space industry include a scientific research base on the Moon by the late 2030s or early 2040s, which would see periodic visits from human crews for maintenance, Zelyony said. “After that, the next stop [for manned spaceflight] will be Mars,” Korablyov said. The experts disagreed on the prospects of manned flights. “I believe humanity will have toyed enough with manned spaceflight by the century’s end…and switch to unmanned flight,” Zelyony said.